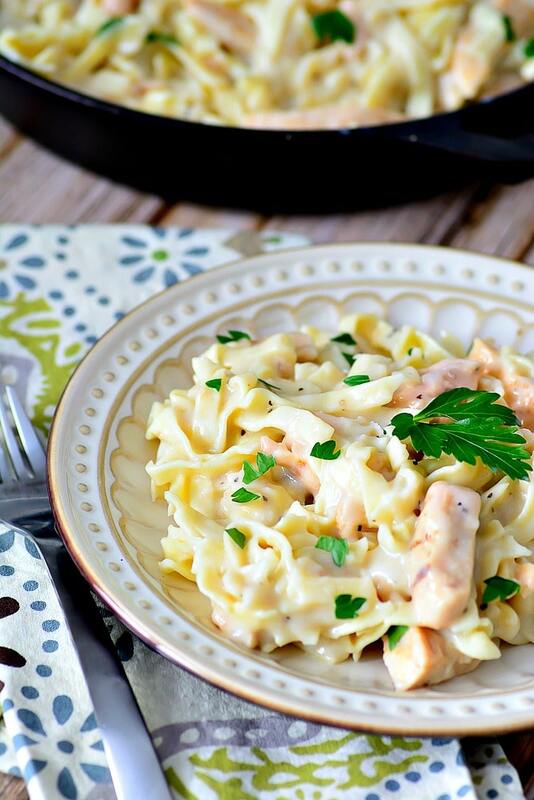 Chicken Fettuccine Alfredo is an easy recipe for a quick dinner any night of the week. 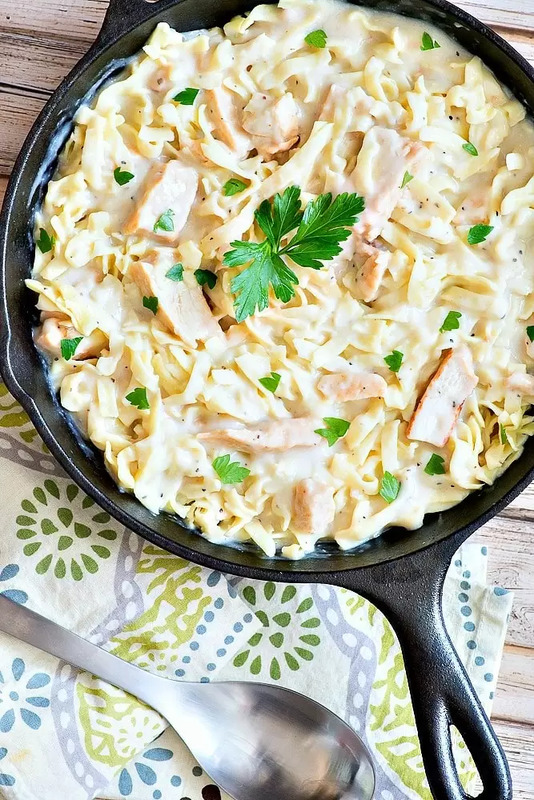 Creamy sauce, fresh pasta, and chicken cooked your way, you can skip olive garden and make sure the BEST Alfredo (and in only one pan!) comes right from your kitchen. Somewhere starting in October we go on a cooking kick. We cook it ALL. Turkey, mashed potatoes, pies, trillions of cookies but then somewhere mid-December, basically right now, we get tired. Please, no more kitchen. Bring on the diet in January because if I have to look at another 2 hours in the kitchen for a meal that takes my family 20 minutes to eat, I will pack up and leave. Or something like that. I am here to rescue you. Not ALL meals need you to be in the kitchen for HOURS! This homemade chicken fettuccine alfredo is so delicious you might lick the sauce from the bowl, and done in about 20 minutes. Of course, if you want to really load up the carbs, add some mashed potatoes bombs as a side. You can also try out another amazing chicken recipe with our Baked Parmesan Chicken. You can also make this with broccoli by steaming up some broccoli and adding when you combine at the end. I always like to start with the pasta when its part of the dinner. Get your fettuccine boiling up and then move to next step. Just do not forget to watch it and pull it off and drain. No one likes overdone pasta! Now move onto making your alfredo sauce. Grab your butter, add to a bowl and stir until fluffy. Then add in your cream until fully mixed and combined with your butter. You may want to use a beater if a whisk isn’t doing it for you. Last but not least, dump in 1/2 of your grated Parmesan cheese and stir. Set your bowl to the side while you go into the second stage of Chicken Fettuccine Alfredo…the star of the show, chicken! Now pan fry up your chicken in a cast iron pan. TIP: If you plan this meal a head of time, you can also boil your chicken for a shredded option or bake it. Additionally its ok to use premade chicken if you are short on time! At this point your pasta and chicken should be done, so just add all of it including your sauce together in your cast iron pan and combine on low heat. Serve and top with fresh herbs and additional fresh Parmesan sauce. This was one meal that was gobbled up in an instant and NO leftovers! Chicken Fettuccine Alfredo at home is so easy with this creamy delicious Parmesan, cream and butter sauce. No need to over complicate dinner when this is done in minutes! Make your fettuccine according to box, drain, set aside. Start with your butter, add to a bowl, stir until fluffy. Then add in your cream until fully mixed and combined with your butter. Fry up your chicken in a cast iron pan. 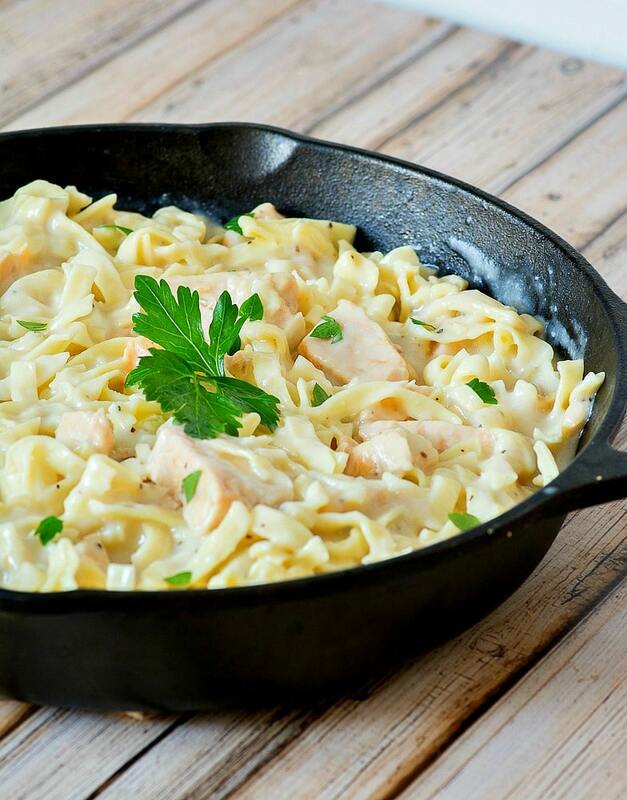 Once drained, add your hot fettuccine, cooked chicken, and pasta sauce together in your cast iron pan and combine on low heat. You can also make this with broccoli by steaming up some broccoli and adding when you combine at the end. If you plan this meal a head of time, you can also boil your chicken for a shredded option or bake it. Additionally its ok to use premade chicken if you are short on time!